Patricia Dusman, an award winning artist originally from New York City and now residing in Doylestown, PA, studied printmaking and photography at Bard College. After a successful 20 year career in medical research she returned to pursue art making full time. Patricia continued her lifelong artistic education by participating in workshops led by some of today’s contemporary artists where she discovered and honed her skills working in various media. She is currently focusing her work on encaustic painting and exploring working with wax in mixed media. Encaustic is an ancient method of painting where pigments are added to molten beeswax and damar resin. Each layer of encaustic paint is then fused with heat using a blow torch. Patricia likes to work intuitively starting with a vague idea of colors, forms and textures derived from nature. She enjoys working with encaustic media because it allows her to explore colors and textures, excavate back into previous layers and really exploit the versatility of the medium. The ability to infinitely go back and forth from molten to solid wax is very interesting but challenging at the same time. The translucent luminosity of the wax is also a wonderful property of this media which ignites her imagination. She has participated in art fairs, group shows and been published in international artist books, publications and exhibition catalogues. 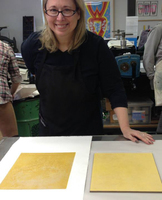 She was a presenter at the recent 7th and 9th International Encaustic Conferences with her talks on safety practices in the encaustic studio. Her work can be found in private collections in the US.